i only stayed 2/11 of my weekends in sf, and went home the rest. there’s an endless bounty of new restaurants to try and murals to see, but it’s not as exciting as if the city was completely new to me. still, i felt compelled to invite some people to visit me, since when else am i going to have a free apt in sf? my friend a came in on a thursday night, and we immediately went hard. not with drinks or parties or clubs, but with food. of course. 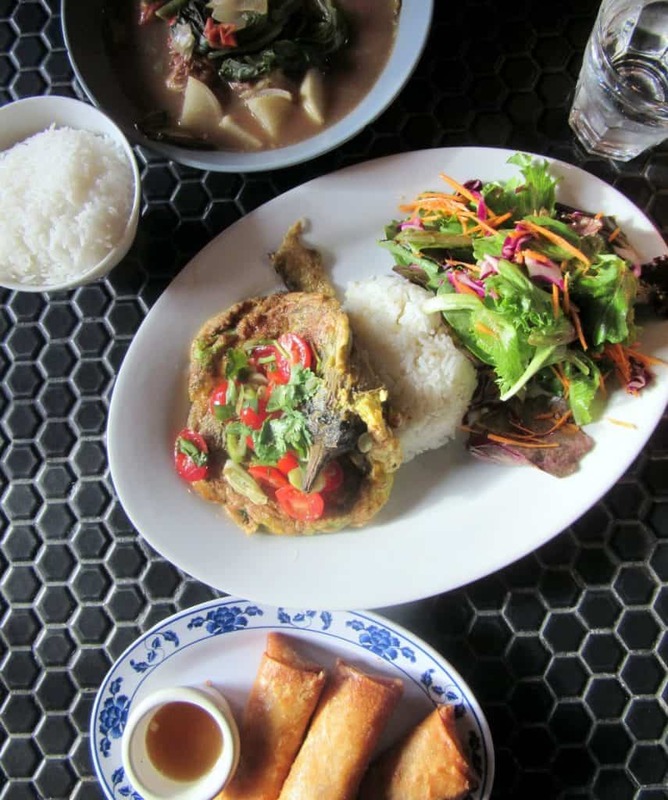 hence the title of this post: rooster and rice (and 12 other restaurants i went to in sf). our first meal was a combo of rooster and rice and sweetgreen. (if you’re like, wow that isn’t decadent at all… don’t worry. we got there eventually). rooster and rice is essentially boiled chicken with rice, cucumbers, sauce and soup on the side. i know i know, seriously? how boring. AND YET. i could care less about the chicken, let’s be real, but the sauce. it’s gingery and garlicky and spicy and salty and you can bet your chickens that we finished the whole container of sauce they gave us. it went well with the juicy chicken, the sticky rice (they have sticky rice that’s cooked with chicken-y goodness), the crunchy cucumbers. yes yes yes. the soup was essentially boosted chicken broth: maybe not perfect for summer, but super cozy and the kind of thing i’d want a never ending pot of come wintertime (if i wasn’t in southern california). we got the shroomami, a mushroom and grain bowl, from sweetgreen, and being the stereotypical california girl that loves salad, was in love. we decided our dinner, while healthy, needed a little something something. so we ended up in hayes valley for souvla’s frozen yogurt with baklava, after a detour in west oakland. bart (essentially the sf subway) continues to confuse me, and this is the second time i ended up in oakland instead of staying in sf like i intended to. sigh. anyways, the yogurt was soft and started to melt almost immediately, though it was creamy and thick and tart like the plain tart frozen yogurt at any frozen yogurt shop. but, not just any frozen yogurt shop has sticky nutty chewy decadent baklava smacked onto it, with a drizzle of honey for good measure. yogurtland, can you add baklava to your topping bar so i can make a makeshift version of this when i’m not in sf near souvla? thanks. i had work on fri, but i met my friend and a couple of our mutual friends in the mission for dinner. we ended up at fob kitchen, a permanent filipino pop-up inside of a bar situation. (much better than the time that my family tried to get ice cream in nyc, and it wasn’t open, so we went into their sister bar to eat ice cream. even though my brother and i were awkwardly and extremely underage at that point. AND THE ICE CREAM WASN’T EVEN GOOD). i had the torta talong, a vegetarian rice plate featuring an eggplant omelette, garlic rice and a salad. the omelette was essentially a whole charred eggplant, enrobed in egg. the predominant flavor was smoke because the eggplant was so charred, but it was tasty when a bite was paired with a super sweet cherry tomato on top. other dishes ordered included another torta talong and the sinigang baboy. the sinigang baboy was a fish sauce heavy soup, with veggies and pork. now, i love fish sauce. i add it to almost anything savory when i have some nearby, and i’m sure it’d be very hard for me to be fully vegetarian because i use it so much. but when this dish slid its way past me on the table, even i recoiled a bit. it was strong. not for the faint of fish, whatsoever. it didn’t taste as strong as it smelled, though i don’t think i’d ever crave this. dessert was at media noche, which we heard of because my friend saw the flamingo (my snapchat says “flaming” because i was pre-occupied with the ice cream) mural they have outside. she wanted to take pictures of the flamingos, and me being me, was interested in their mi abuelita favorita moon bar, or a guava ice cream bar with cookies and chocolate. sounds awesome, but it wasn’t quite as guava-y as desired, since the cookies kind of steamrolled them. sigh. so we ended up at roll up, and shared an ube/vanilla swirl. i thought the ube was very mildly flavored, but i don’t think i truly know what ube tastes like lol. i was surprised that the aesthetic of the shop was so dark, given the tendency for instagrammable places to be white and minimalist, though that has nothing to do with the fine but not awesome soft serve. the next morning we were up early (with much bemoaning and laziness on my part). our first stop was devil’s teeth baking co for splitting a breakfast sandwich and cinnamon roll. the special breakfast sandwich, with scrambled eggs, cheddar (subbed for pepper jack), bacon, avo and lemon garlic aioli on a biscuit, was pretty delicious. i mean, how can you go wrong? decadent and hearty and tons of textures. 10/10 would order again, even though it takes some time to get your sandwich (they only turn out 4 at a time, since they’re scrambling eggs in 1 skillet in the back to order). i have more reservations about the cinnamon roll. it’s massive, and not the kind of thing that 2 girls who are also eating a breakfast sandwich should devour sans milk. it’s more of a sticky bun, with that gloriously shiny top and no cream cheese frosting in sight, so keep that in mind if you’re craving a more traditional cinnamon roll. 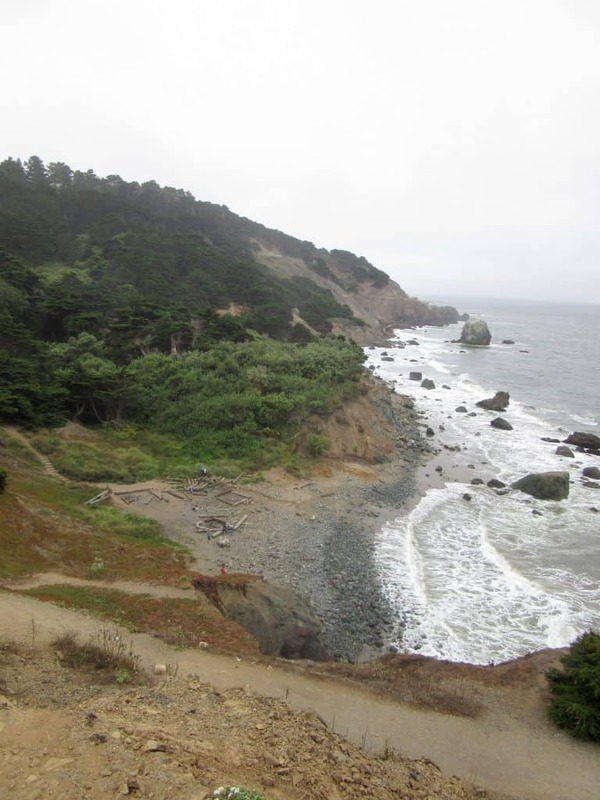 and then we made the regrettable decision to hike near sutro baths and lands end. overall we only walked 4 miles, but there was elevation gain and laziness and out of shapeness, and by the time we made it to the parking lot, we were too pooped to walk to lunch at kim son, which ended up only being a 4 minute lyft ride. whoops. we both ordered cold vermicelli noodles with grilled pork (mine with shrimp, hers with egg rolls), which were refreshing after our sweaty meandering. and in spite of the fact that both of us were full, we ended up at fifty/fifty since we had some time to kill. after the sugar overload from that cinnamon roll, i opted for a half sweet mango jasmine tea. i wouldn’t recommend getting it half sweet. i think the majority of the sweetness comes from the mango, so it seemed like in asking for it half sweet, i also asked for it less mango-y. my friend got milk tea, which was fine but not as strong on the tea as i like. portions felt smaller despite it being the same price as other milk tea shops. cute place, not sure i would go back. and then, the moment we were all waiting for: color factory. for once my impulsiveness regarding tickets was good, since we got tickets before they all sold out. if you like interactive museums, i highly recommend this one, since they have everything from a scratch and sniff wall to my personal favorite, a massive (we’re talking 3.5 ft deep and medium swimming pool wide) ball pit. and did i mention that they have ice cream from garden creamery as you depart that ball pit?! yes. our last stop was tacorea for a kimchi burrito before she had to catch her train home. it had plenty of kimchi, which was perfect for this kimchi lover. it was a bit on the spicy side, and i found myself sniffling into my napkin more often than not. i was surprised overall that their offerings didn’t skew more korean; there were a few korean meat options (ie bulgogi), but the burrito we got was the only thing on the menu with kimchi, and you could easily get a normal, non-korean at all, burrito. not a bad thing, just unexpected after my experiences with other korean-mexican joints. i was greeted by another friend the next day, which was us walking to food, eating, then walking to more food. wash and repeat, until you’ve walked 9 miles and consumed an acai bowl, thai food and lemonade. we started with an acai bowl at basik cafe. if you start your day with fruit and spirulina (don’t you love algae?) and hemp hearts then you can be free to eat anything for the rest of the day, right?! we waited a good amount of time and paid $14 (oooooops at least it’s healthy? ), and it was refreshing, but man, my wallet was pained for a bit. and then we walked some more for khao soi and pad thai at jitlada. which is not the same establishment as, nor is it associated with, the lauded la version. sigh. 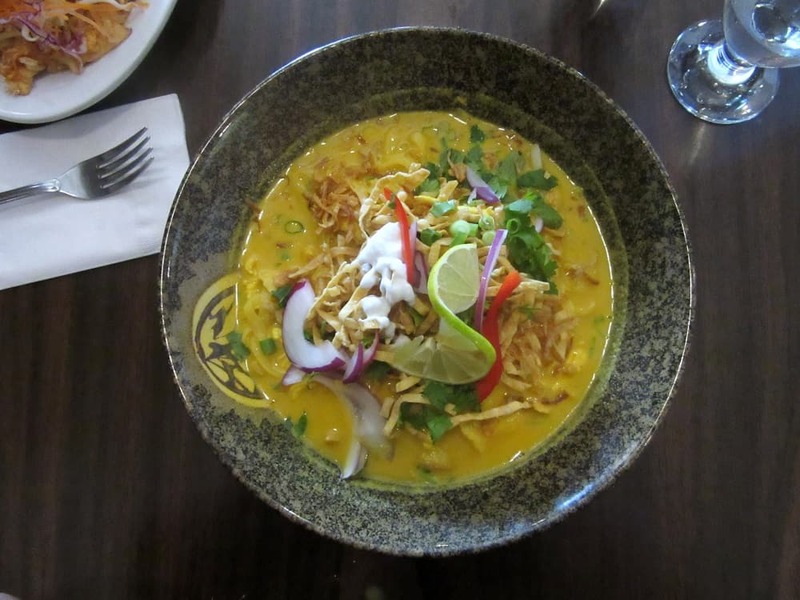 i still enjoyed it though, and my khao soi was the perfect mix between curry and noodles (i’ve also never had it before so who knows if it’s unauthentic). the pad thai was whatever, but again, we weren’t that hungry lol. the one thing my friend really wanted was milk tea from asha. sure, i said. that’s right next to my apartment, i said. and somehow neither of us realized that it was closed on sundays until we got right up to the door. argh. so then we went to boba guys…. where the line was its typical long and windy and disneyland-esque self. so then we went to steep, and got strawberry matcha lemonades. it was stressful, but she got her lemonade right before she had to dash out and leave (meaning she was running across the crosswalk while i gave up trying to follow her and was like BYE SEE YOU LATER). and while it was refreshing, also not sure it was worth. it tasted like a good, tart strawberry lemonade, but there was no discernable matcha flavor, just the powderyness that comes along with it. oh, well. yeah, bart still confuses me lol. the most i can deal with is the 30 and 45 lines on the muni, bc their routes are short and it’s hard for me to get lost lol. That cinnamon roll/sticky bun looks insane! 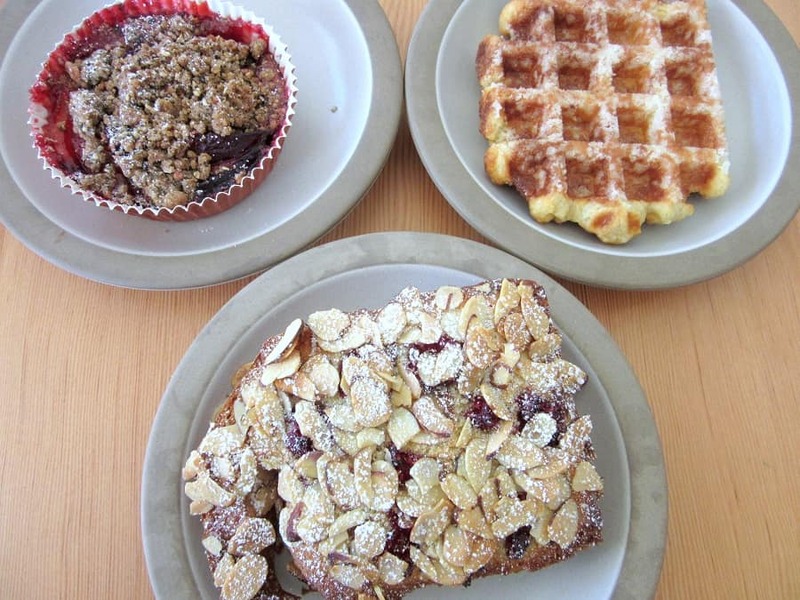 Sounds like you’ve had some amazing food in SF–I know who I’ll hit up for ideas next time I travel out that way :). Have a great week, Heather! it was insane!!! probably not meant for 2 people to eat during one sitting, especially if there’s other food involved lol. Sounds like an amazing weekend of walks and food! It all looks so beautiful, too! I totally agree with your comment early on about the sauce always being the most important part. It’s EVERYTHING, isn’t it? Makes me want to go to SF. sauce makes or breaks things! hope you get to go to sf soon, too. there’s always something to do, and i love that it’s so walkable. sounds like you had so much fun! 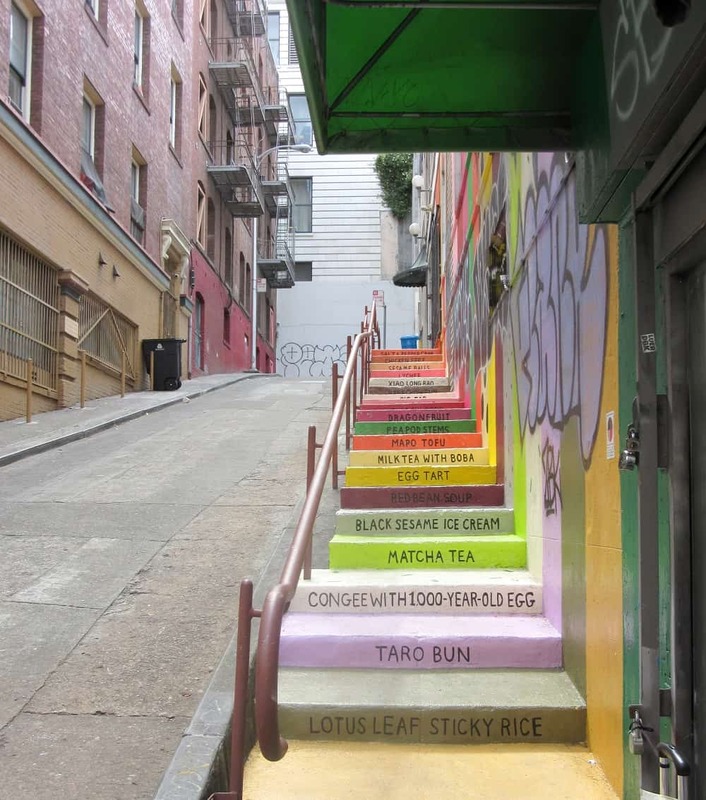 i have not tried boba guys and am dying to but i’m scared of the line up…the color factory sounds right up my alley but i’m so jealous of sf getting an ice cream museum!!!! 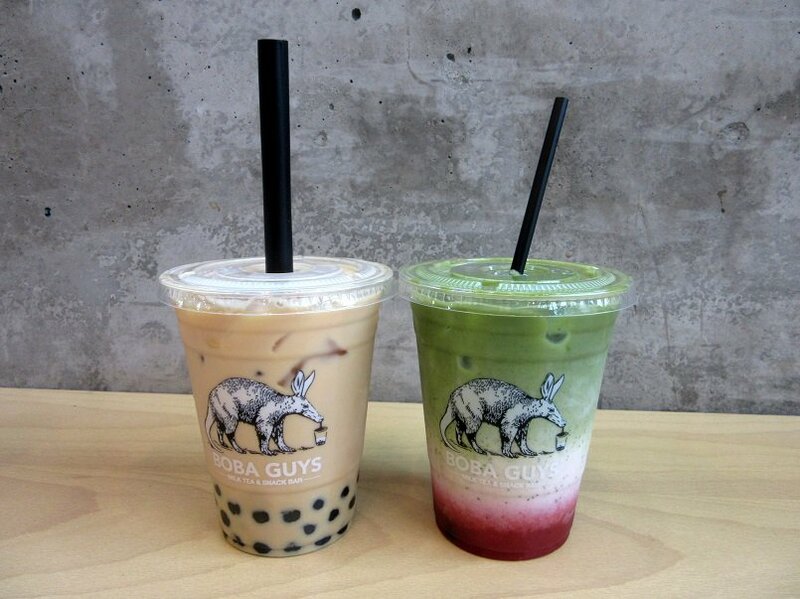 highly recommend boba guys! they have the usuals too, so if you chicken out of a scary one, then you have a back up option (: i wasn’t dying to get ice cream museum tickets, mostly because i feel like i’ve seen a lot of it on social media already. everyone who’s gone so far seems to have really enjoyed it though! All of it sounds so wonderful Heather! 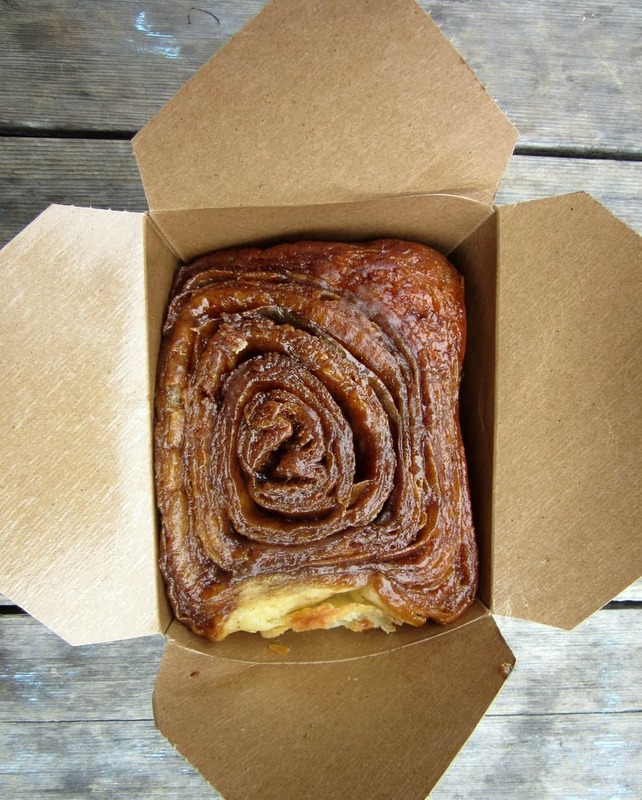 That sticky bun looks to die for amazing and the yogurt with baklava…ooooooh my goodness!! 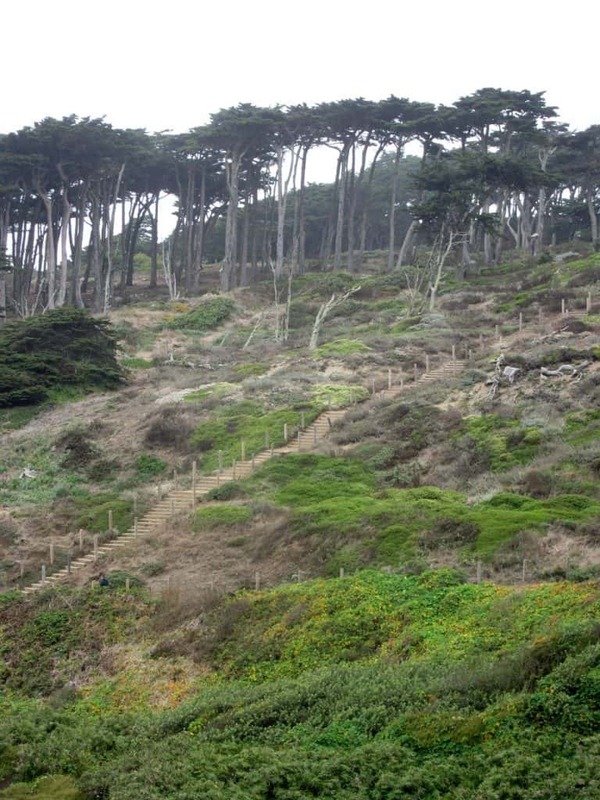 What a great resource for people visiting San Francisco. Thanks for sharing. What some great places! I’d love to go to San Fran, if I do I know what I’ll be reading first! sounds like it might be time to visit again (; i’m sure there’s a ton of new things to experience, so it’d almost be like going to a new city! That cinnamon roll looks amazing!! YUM! Laminated dough in cinnamon rolls is the best! Looks like it was a definite adventure!! Any trip has a few ups and downs but look at how much you experienced, saw, and tasted! Yum. 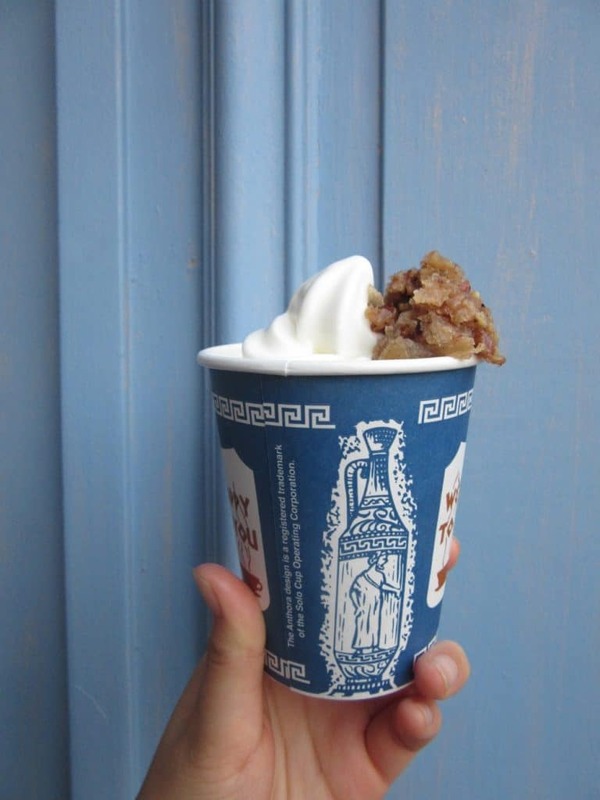 I’ve been seeing that Greek Frozen Yogurt around a lot lately. Man, if I could eat frozen yogurt, I would DEVOUR -DEVOUR that I tell you!!! i think it’s been circulating a lot on the interwebs because they did a collab at feast portland! i think as long as you think of it more as a sticky bun, you’d enjoy it :3 and yes i hope you get to go to sf and eat all the things there! Sounds like you had lots of fun and good food! Sounds like you had a lot of fun! Wow! SF has an amazing food scene. All the food pictures are making me so hungry; I love the idea of kimchi burritos and that cinnamon roll looks huge! This sounds like my kind of trip, I love traveling and eating, unfortunately my fella is not so into eating all the time. I really need to find a new travel companion….lol. You are surrounded by so many good places to eat! kimchi burritos sound like GOLD! kimchi burritos are the best!! there’s something about funky, crunchy, tart kimchi that goes so well with mexican food. Sounds like you a delicious weekend. I’ll be in SF in a couple weeks to attend a wedding. I’ll have to check out some of the places you mentioned! hope you had an awesome time at that wedding (and eating hopefully plenty of tasty goodies!). I need to print this out and take a day trip to San Fransisco. Everything looks and incredibly fabulous Heather!!! That’s my kind of visit, one that is centralized around finding food! 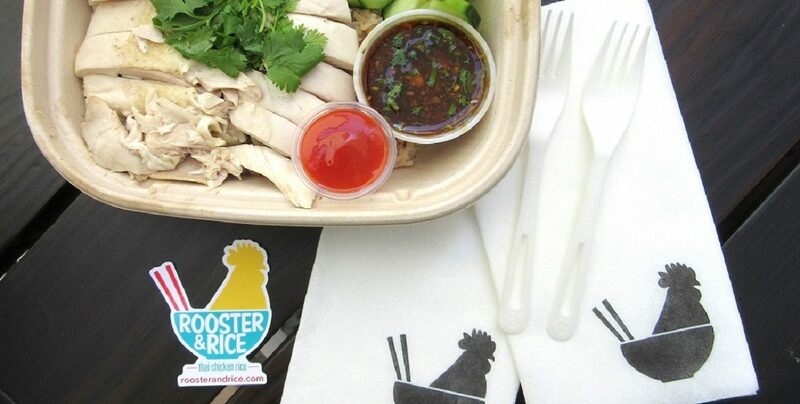 I so want to try the rooster and rice now. And that yogurt baklava is sounding pretty good too! 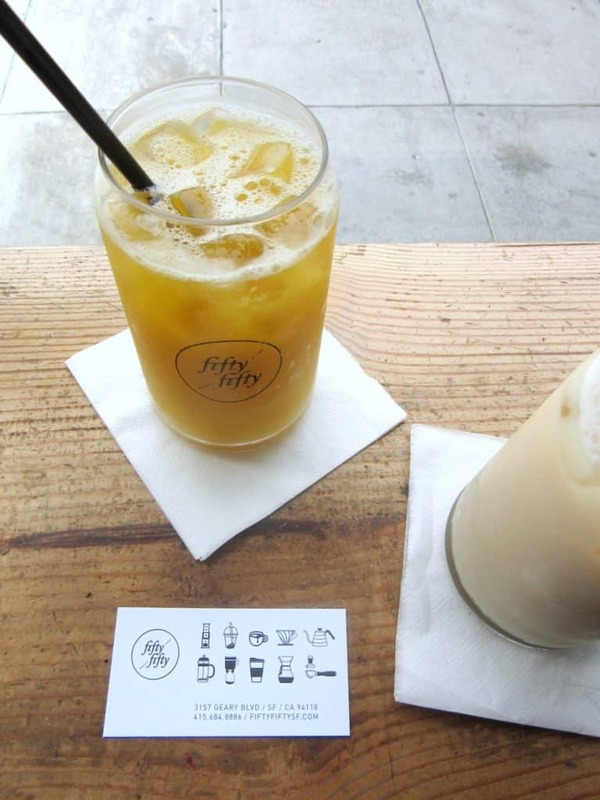 This is a great compilation of food and placed to visit in SF. I hope to get there someday!